We are back with our fifth day of new release introduction! And let me tell you, I think we definitely saved some of the best for last! Scroll and enjoy! Mountains are so beautiful and majestic! This multi-step mountain border image will allow you to incorporate some of that majestic beauty into your next paper crafted project. Perfect for masculine or travel projects, you’ll have fun creating all sorts of scenes. Use ink sponging or watercolor techniques to create night sky or sun ray backdrops for a dramatic effect. The trees and eagles provide the perfect finishing touches. Enjoy the ease of allowing this cover plate die do all the work for you! With just one cut, this mountain scene has it all! 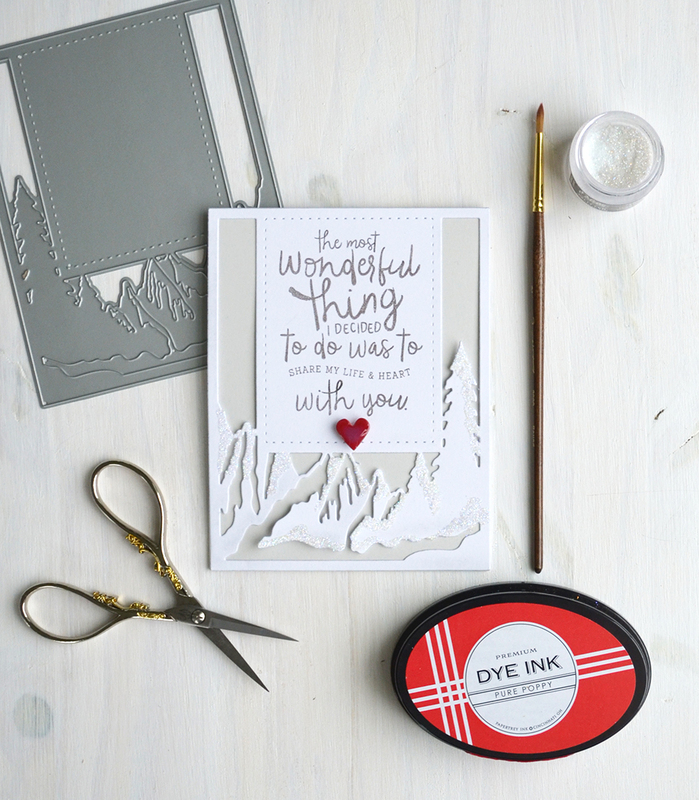 From the detailed mountains and trees at the bottom to the blank area perfect for showcasing your sentiment, you can put together a card in minutes. 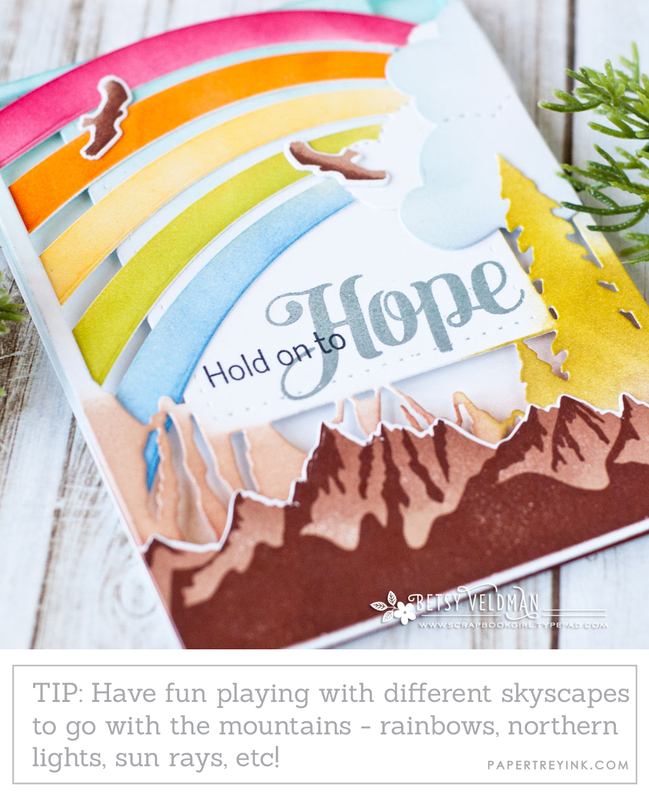 Leave the die-cut as is or enhance it with your favorite coloring techniques! The Psalms are filled with verses of thanksgiving, praise, encouragement, and comfort. Each month, the Year of Psalms series will feature a verse set in a beautiful font combination. The passage chosen for July is from Psalm 121:1-2, and is perfect for creating cards and projects for sympathy, encouragement in difficult times, and more. Everyone always needs a little encouragement now and again. 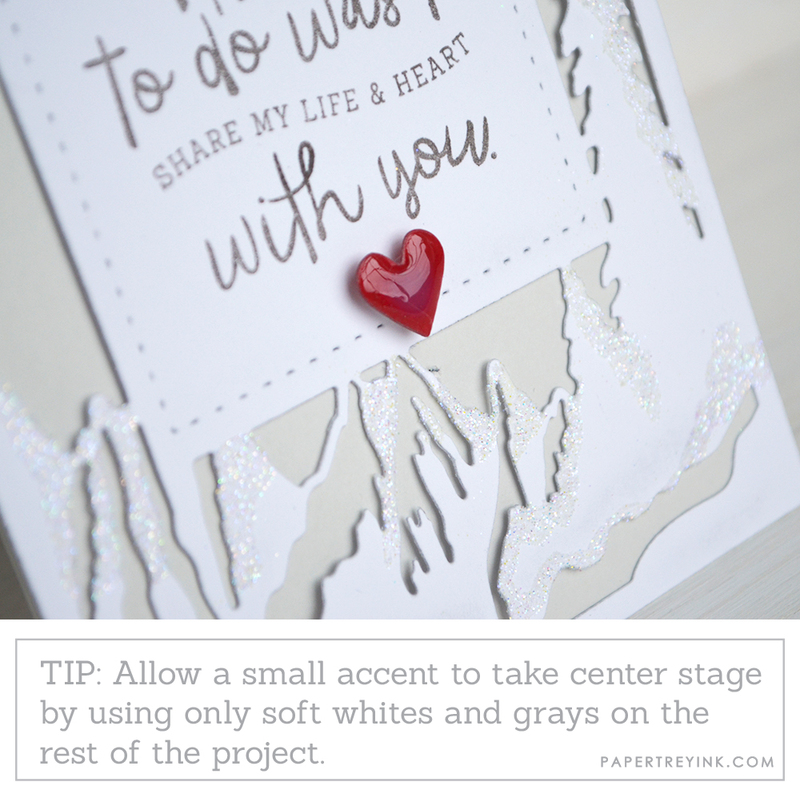 This card is a great way to let someone know you are thinking of them and cheering them on behind the scenes. I stamped the mountain scene directly onto the white cardstock in shades of teal, layering all of the various building images Betsy included in her new set. I heat embossed both the sentiment and a tiny moon to help accent the gold calligraphy ink I used for the stars. Sometimes with the more intricate dies it is nice to just keep things simple and let the intricacy speak for itself. I die-cut the Cover Plate: Mountain Majesty from white cardstock and highlighted a few areas with Prisma glitter using a two-way glue pen. The new Quoted: The Most sentiment fit nicely in the allocated area. The new Year of Psalms: July set is the perfect companion for the Cover Plate: Mountain Majesty die. I sponged Spring Rain ink onto the white card base first and splattered it with a bit of water to get softer areas like this. 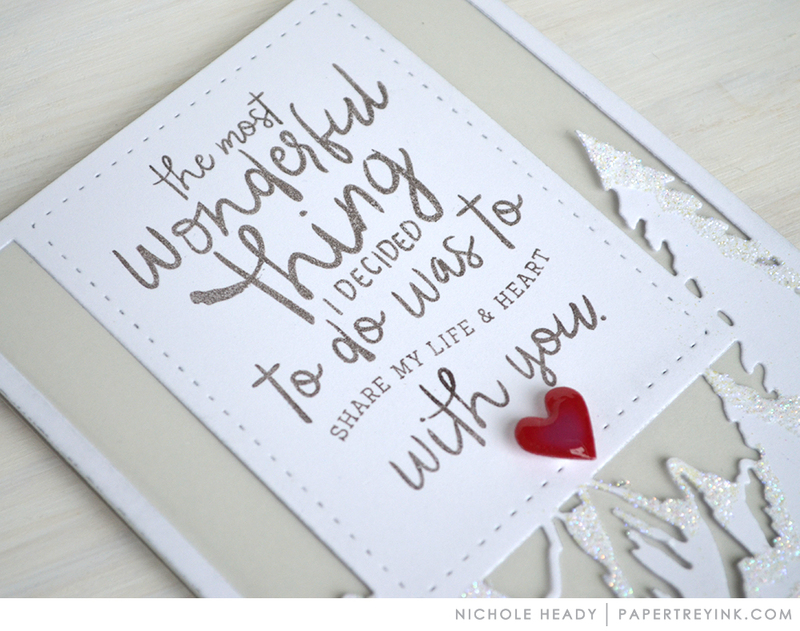 The main sentiment is heat embossed in white onto the kraft cardstock to give it some extra pop. Betsy Veldman is joining me today, featuring Mountain Majesty. Now if this card doesn't cheer the recipient, I don't know what would! 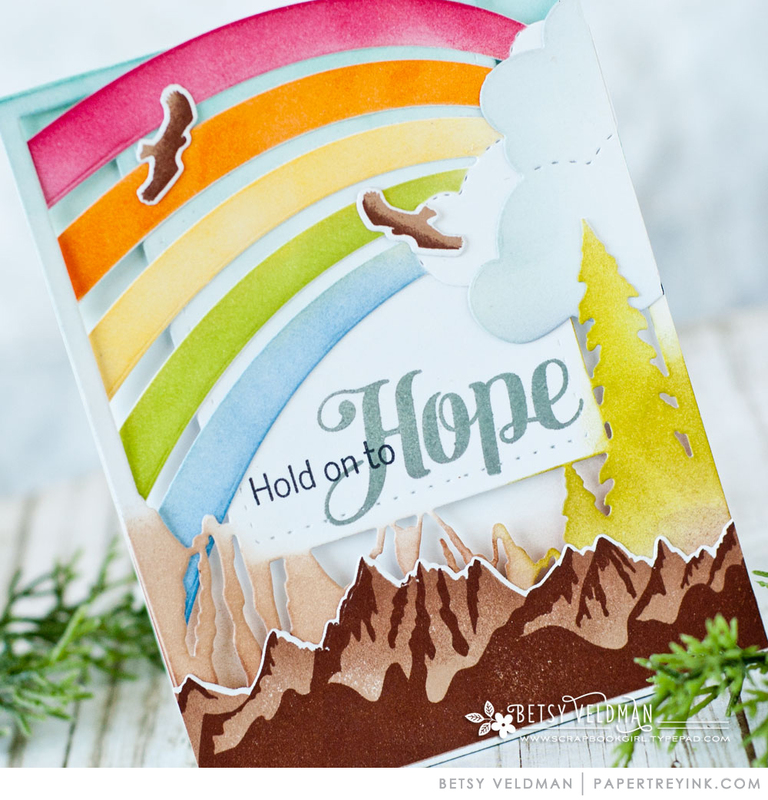 From the beautiful rainbow to the calming mountain scene created by pairing up the Mountain Majesty stamp set and cover plate die, this is definitely a showstopper! The addition of the soaring birds included in the set is a great finishing touch and helps leaf your eye to the various elements. 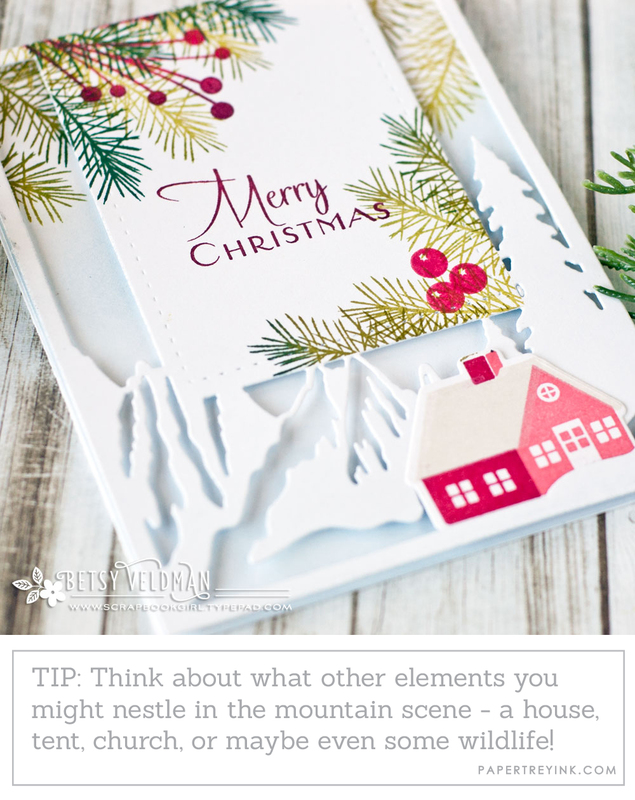 The new Cover Plate: Mountain Majesty die is great for Christmas cards too. Pairing it up with elements like spruce sprigs and even a small snow covered house give the die a whole new direction. 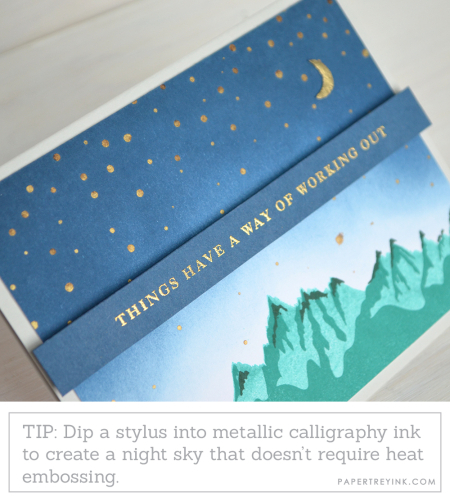 The light sponging of ink behind the intricate die-cut helps all of the details to pop. The purple tones that dominate this card certainly reinforce the "majesty" portion of this product lines name. The contrast of the purples and oranges is simply stunning and a beautiful tribute to the verse. Dawn McVey is joining me today, featuring Year of Psalms: July. The watercoloring Dawn did here is so beautiful and really transforms the new Cover Plate: Mountain Majesty into a work of art. I love the way she left lots of white areas while painting so that it took on a more freeform, artistic look. The sunset poking up through the side openings is such a genius use of that space. The Mix & Mat: Postal dies were the perfect thing to pair up with Year of Psalms: July because of the size and scale. It allowed a bit of extra room at the top to frame out the fuchsia flowers. One of the wonderful things about all of the Year of Psalms sets is that you can really adapt the sentiments for any recipient based on the other elements you combine with them. The new Cover Up: Quatrefoil is a great example of this. The vibrant colors watercolored over the embossed pattern are eye-catching and make a statement. I hope you have enjoyed all the creations that I have shared with you today! So what are your thoughts about the new Mountain Majesty products? And what about the verse Betsy selected for the Year of Psalms set this month? We would love to hear your initial thoughts on everything we introduced! Please leave a comment on this post to tell us what you think of the new products and you will be eligible to win big! You have until 7am ET, Saturday, July 15th to leave your comment and be eligible to win. Only one comment per person please. One randomly selected winner will be announced on our July Release Winners Page before noon ET the same day. Thank you for stopping by today and best of luck with the contest! OMG! I love those majestic mountains! When I saw the sneak peek in the preview I didn’t think I would have any desire to own them but the design team proved me wrong! Such a great item for masculine cards and can be paired with many other stamps set I already own too! Gotta love giving new life to “old” products! Love the new mountain dies…something a little different and you’ve shown various occasions for use. Wow! That Mountains Majesty cover die is a show stopper. Lots of great inspirations today, Design Team. That mountain majesty set is gorgeous. I love the Mountain set and it does go so well with the Year of Psalms July stamps. I love how each DT member used the mountain majesty set to create such beauty. The mountains and coverplate are amazing!! The mountain cover plate is gorgeous! I love all the ways it’s been showcased today! The new Year of Psalms & Mountain Majesty are gorgeous! Love you, Papertrey Ink! Awesome! I have to admit that I instantly thought what a great Christmas card this Mountain Majesty set would make! Wonderfully artistic projects with the mountains and year of the psalms. Oh! I love all the Mountain Majesty products! I am so thrilled about these items. Top of my list! All the projects are so beautiful. I especially like that I can make cards that I think are pretty but that are also appropriate for guys. Spectacular DT projects! 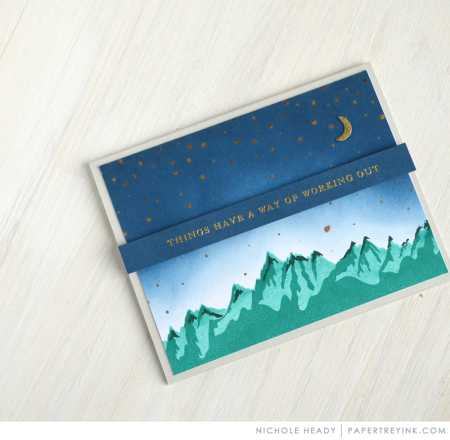 Love the mountains stamp set and the cover plate! Mountain Majesty is stunning!! And so are today’s projects. What a beauty-packed post! Very beautiful in concept and execution. 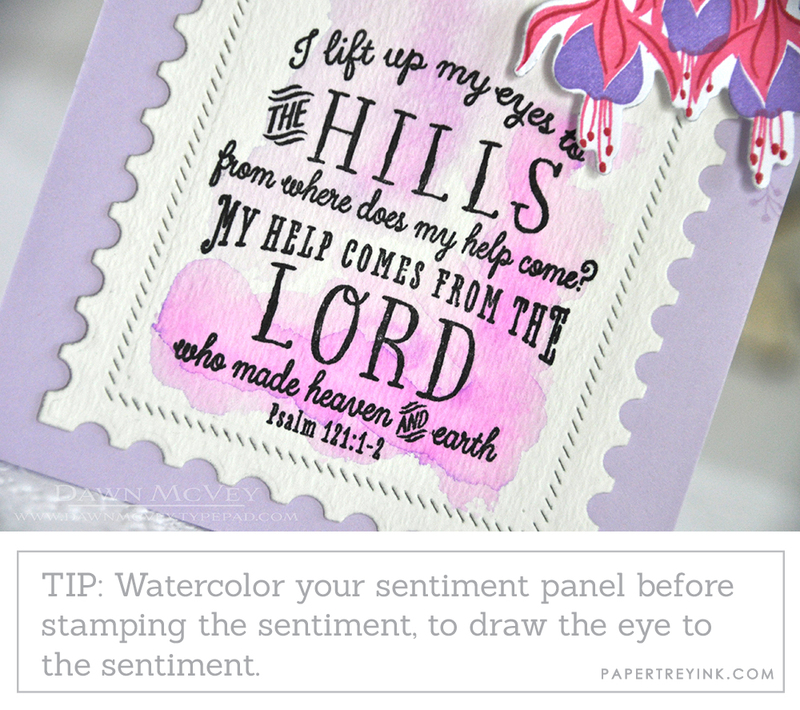 Oh that mountain set is just beautiful and so perfect with the Psalm! I love the versatility, it looks so wonderful with the cottage from Winter Village, too! Love these majestic mountains and the new Year of Psalms. Fabulous creations. LOVE everything about today! The mountains, the verse, the DT examples – all amazing!!! Such a clever design — a cover plate with a built-in canvas for words or images. Beautiful! I love the Year of Psalms series; perfect verse for the majestic mountains set this month. Thanks for sharing the creativity! The mountain set is beautiful and , of course, I always wait in anticipation for the Year of Psalms verse. The majestic mountains are beautiful. What great additions to your line. Love the Year of Psalms verse, too. Everything is so beautiful. Love, love, LOVE!!! I am so excited about these releases! Ever Is wonderful this month. The mountain dies are awesome, I love the Square space on the coverplate for stamping a verse, or any sentiment! I HAVE to have the mountain products!! So beautiful and the samples REALLY sold me on them! What a beautiful concept. Those mountains are wonderful and the samples by the designers are great. WOW! OMG! LOVE those majestic mountains! I love the mountain sets and the card samples are gorgeous! OMGoodness, what a wonderful set and beautiful, beautiful creations!! So unique and different form what I have seen..love it!! Love the mountain scenery! Lovely way to layer and add dimension to cards! The majestic mountains is so unique – so may possibilities! The majestic mountains set is beautiful! 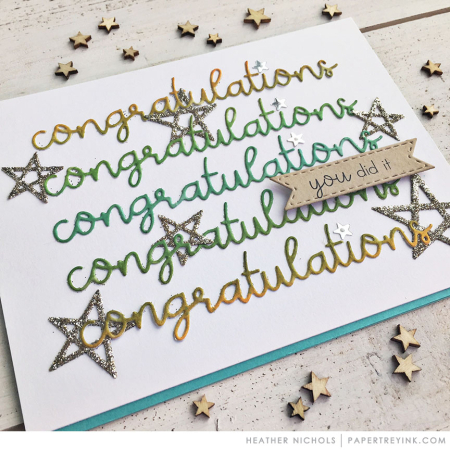 What amazing new products and cards! Tons of great stuff again this month! Loving the congrats card with the multiple die cuts. I love the Cover Plate: Mountain, and how the square section balances it perfectly to make a unique design. The mountain coverplate is beautiful and useful no matter what time of year. Mountain Majesty is so gorgeous, and so many ways to use it! Wow-love how everyone used the new Mountain Majesty products. I am ROCKY MNT. H I G H over the Mountain Majesty suite. You definitely did save the best for last! I absolutely love the mountain majesty sets and the psalm! 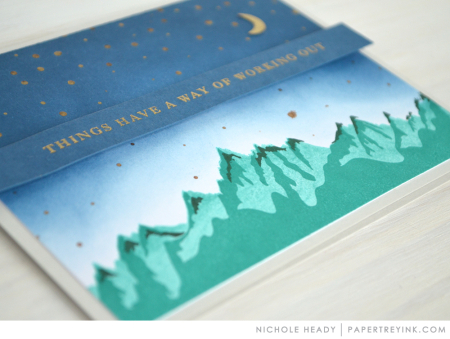 And I loved the winter example with the mountain majesty … how well that would work with the O Holy Night stamp set! This is the day I have been waiting for, to see the mountains in use. The stamps and dies are beautiful! So many great stamps this month! Love the majestic mountains. I really love the latest addition to Year of Psalms. The Mountain Majesty set and cover plate caught my eye in the sneak peeks. The projects made with these are just stunning. Love how they can be used to showcase beautiful sentiments like those shown here today. What a talented design team! oh, those beautiful projects done with Mountain Majesty are outstanding! 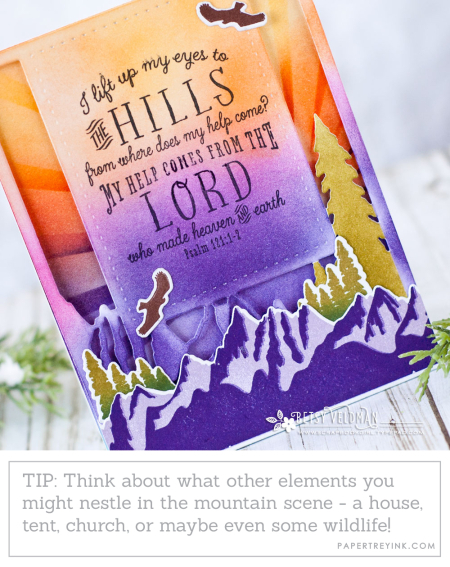 Live the Year of Psalms and the new Mountain Majesty is a great addition to this line and so great for many other cards. Wow! Betsy’s mountain cards are absolute works of art! Beautiful! Wow! The mountain cards are all so stunning! Betsy is such an amazing designer. Breath-taking samples today. I love the Mountian Majesty cover plate, it’s lovely. And the July Psalm would have a happy home with me as it is one of my favorite choir songs (arranged by John Rutter). Just seeing these beautiful cards makes my heart sing! This die is absolutely beautiful !!! What gorgeous new sets!! Can’t wait for release day! So excited about today’s release! 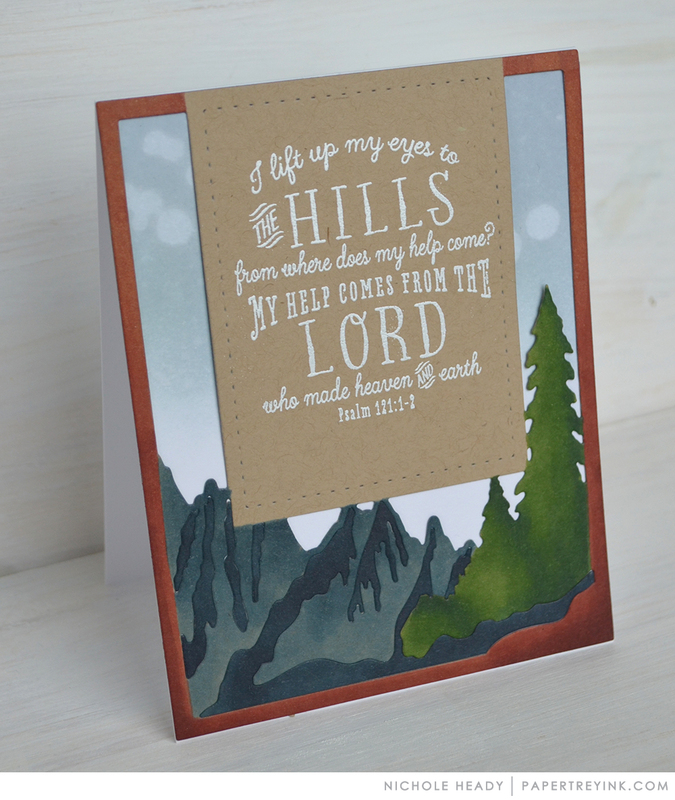 Those mountain products remind me of our recent vacation out west to the Black Hills and that is one of our family’s favorite Psalms. Majestic Mountain is such a unique plate! WOW! Love the cover plate and the mountain set – great for masculine cards!! Wow the mountain cards are captivating today! So lovely! The Winter Village and Year of Psalms are favorites for me already, this month. It makes me excited to start on Christmas cards already. I love the mountains cover plate for its simplicity in creating beautiful scenes quickly and easily. A wonderful release – so many lovely products! LOVE the Majestic Mountains! So excited!!! 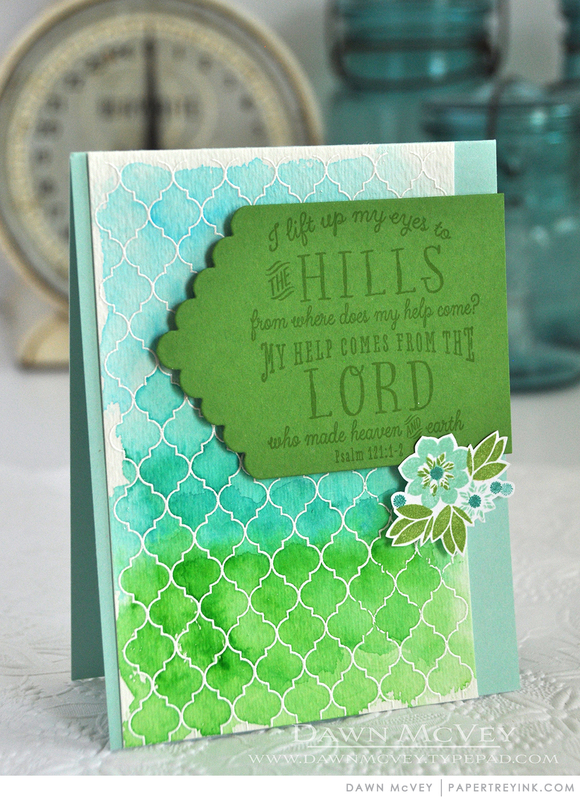 Continuing to love the Year of Psalms stamps! I must be getting to be in a Christmas mood because, once again, it is the Christmas card that Betsy made that is really appealing to me! Really like the way the mountains stamp! 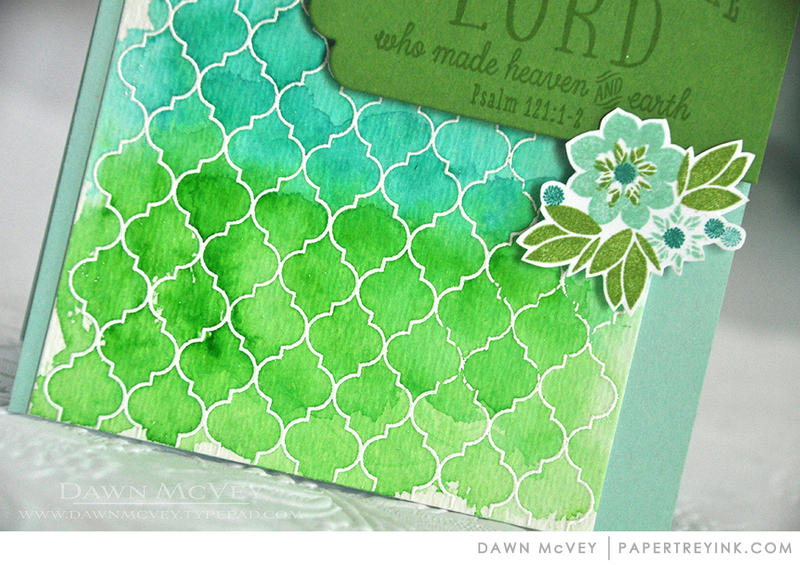 I love the quatrefoil stamp, so useful and beautiful! Wonderful projects today. Cannot wait until tomorrow to see all of the terrific new products. Cheers. Great mountain dies! PTI has always the best and creatives ideas! Love Mountain Majesty stamp and cover plate! So many possibilities with the Mountains set! Great Ideas! I love this new cover plate. The mountains are beautiful. Very beautiful projects today. The Mountains are lovely! A moment please, to pick up my jaw! Mountain Majesty is positively majestic!!! You think of everything, and them some. Loving the psalms and hope they never end!!! Wow, so clever and fun. I love these new mountain supplies. And the Psalms stamp is fantastic! I have enjoyed all the beautiful design team samples this week. Oh, wowza, those mountain scenes are breathtaking! I love how well the sets coordinate and the possibilities abound! Mind blown. 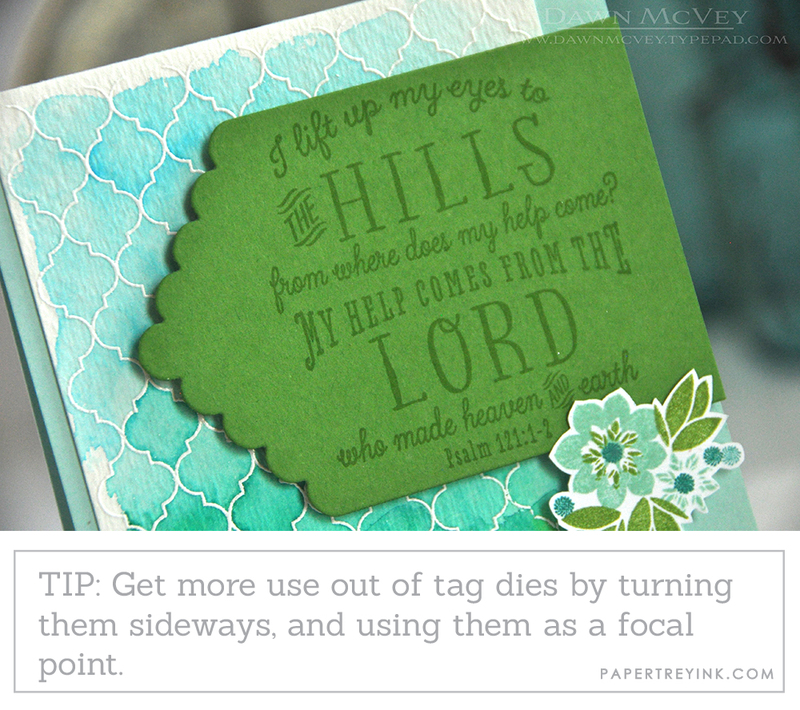 I love the mountain stamps and dies, especially the large cover-up die! They will be so versatile. Oh! The mountains! How pretty! Lovely projects! 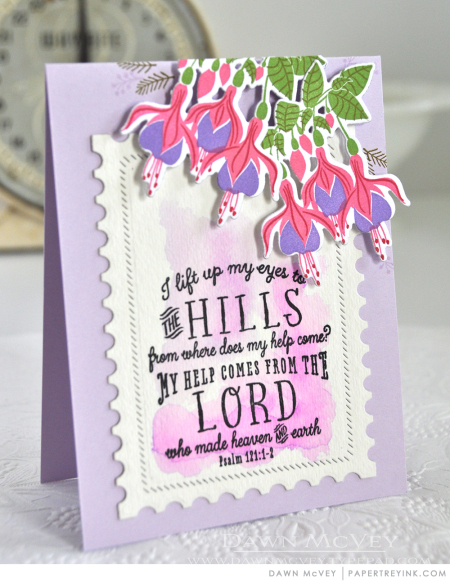 Wonderful Majestic Mountain stamps, dies, and cover plate … perfect with the beautiful Psalm verses! The mountain majesty is just beautiful and so very versatile. Oh I love Mountain Majesty! So beautiful! So many possibilities! The new mountain stamps and dies are really pretty! Love the cards you showed today! What a fabulous release this month! Today’s projects and products are all stunning. I especially like the Mountain Majesty cover plate! Everything is lovely, but the Christmas card is the best! So many great ideas! I really liked the mountain cover plate used for a Christmas theme. So beautiful. I’m absolutely in love with the majestic mountains stamp set and also the cover die!!!! They are just spectacular and I must have for myself ❤️ The designs the team have put together are also just stunning , and I love the range of different styles that were created from these!! OK… I may have to buy all things Mountain Majesty! I am so inspired by all of the examples shown. The mountain majesty sets are so clever and the Psalm is just perfect. So much inspiration! I love the samples and color choices. I love the mountains they are awesome. The majestic mountains are beautiful! Love seeing the eagles soaring over them, too, it creates a gorgeous scene! Those mountains are SO cool!! Majestic Mountains is a stamp and cover plate that create inspiration. I’m excited to try my hand at building scenes like the beautiful examples done by your design team. Release day is tomorrow. Yay!! All beautiful creations, but I’m totally taken with the blue beauty and that star-filled night sky! 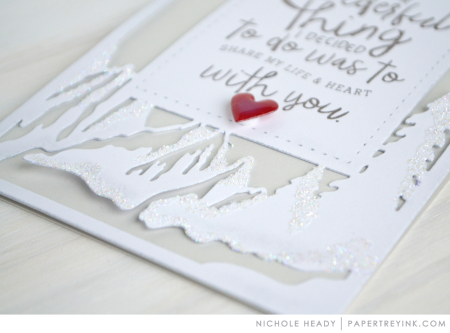 Mountain Majesty is such a great title for these products – so beautiful! I love the samples where the mountains are shaded – just truly gorgeous! I may have to agree with you about saving the best for last! I adore all the products & projects today! That Psalm was a favorite of my mom & she always included it when she gave her testimony. Was thinking I might not get any more coverplates, but oh boy are those mountains calling to me! I am enthralled with the Christmas card–one of my all-time favorites! I am blown away by the Mountain Majesty series! The design team have created such stunning cards with it! I am in love with the Majestic Mountains. They will work in so many situations. I can’t wait until tomorrow so I can order. Today’s preview is gorgeous! And I love the new cover plate – any time you can produce an entire card-front layout with one die, I’m all in! Love all the mountain stamps and dies. The psalms stamp this month is close enough that I want it. The wonderful thing sentiment is really great too. Oh, I am in love with the mountain majesty stamp and die set… the July verse is perfect with the image! So, so, so pretty! Wow. Those mountain sets are simply stunning. Such an impressive display of cards today from the design team, just magnificent! I just love these mountains. Of course the DT projects make me want it even more. Super excited about these mountain themed releases! Beautiful cards. Loving the Psalm series! The mountains cover plate is well designed! 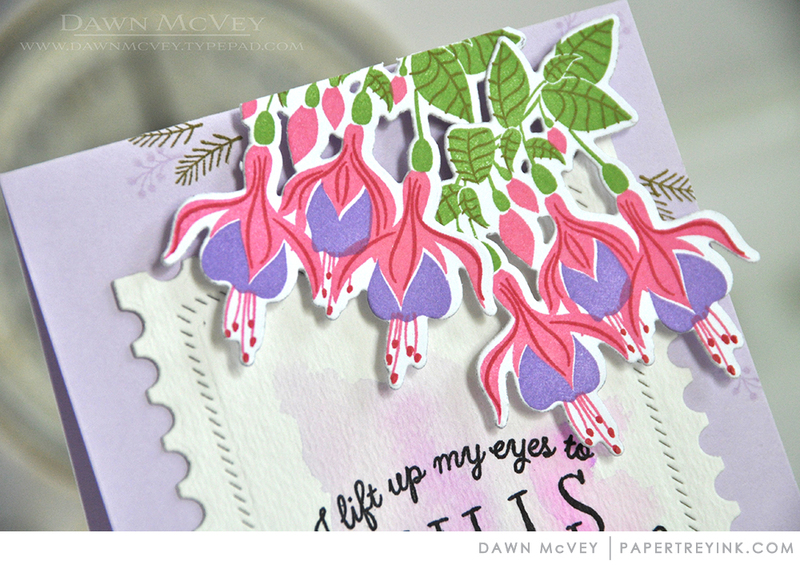 Beautiful projects with a heart out to Dawns’ watercolor! Wow! Those mountains are majestic! Wow these are all so Beautiful! That year of Psalms is one of my favorite scriptures. TFS, PTI! Really really beautiful. That mountain die can be used in so many different ways! I only own one die cover panel (bandanna from county fair) but it makes me appreciate how much a cover panel can help you instantly make the front of your card almost complete. So I love the mountain majesty cover plate. It will also go wonderfully with the last Psalms that was released (green pastures…quiet waters). I LOVE the Mountain Majesty stamps, dies, and cover plate. They are just so gorgeous! Thanks for the chance to win a gift certificate. The mountain stamps and cover plate will make a nice addition to my supplies. I love the versatility of the Mountain Majesty set! Great for any season and would make a good masculine card. Thanks again, Betsy for another great set. Wow! The Mountain Majesty stamp and die are gorgeous. They go so well with this month’s Psalm release, it’s almost as if you planned it that way. lol. The mountains – both the stamps and cover plate – are amazing! I need a lot of masculine cards and the mountain stamps offer so many possibilities. Looks like you have another great release on your hands! 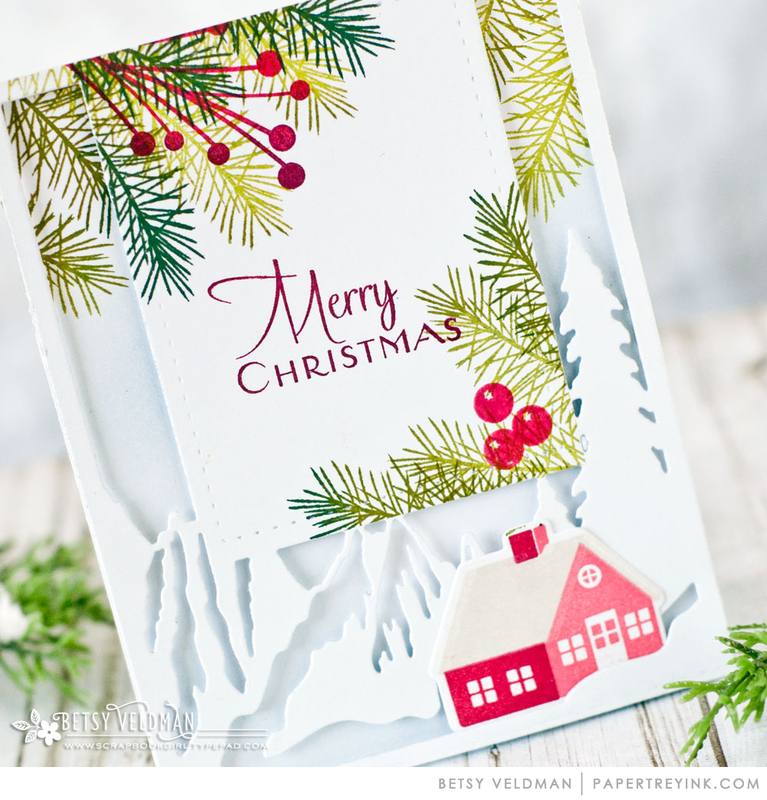 Love Betsy’s Christmas card with the subtle “snowy” mountains in the background! Lovely projects. What a beautiful way to wrap things up…gorgeous release. The mountains are beautiful as well as the Psalms verse. Absolutely gorgeous works of art today…you have outdone yourselves! You have hit it out of the park with these new dies! Awesome! Love the mountains!! So perfect for so many cards! Wow… Mountain Majesty is spectacular! 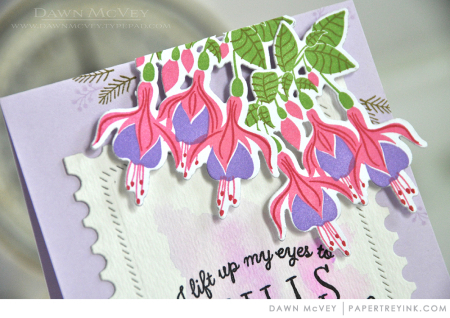 Gorgeous creations using this beautiful stamp set, and the die is amazing! Love the majestic mountains! So versatile and unique! Great release! I am really enjoying the new tips included in the releases. Love love love the coverplate… OMG.. this is gorgeous! Love the Majestic Mountains and cover plate! So much great inspiration today. Very magestic and encouraging release today. I love the mountain stamps and dies. I really love the card with the rainbow added because I already have that set. I love the Year of the Psalms stamp set! That is one of my favorite verses and every time I read it it has me singing praises. What an Amazing release!! So many beautiful products and the DT did a Wonderful job showcasing each and every one!! I can’t wait to order tomorrow night!! Love it! Betsy’s cards are amazing! I knew I needed the mountain set as soon as I saw it paired with On the Wagon. 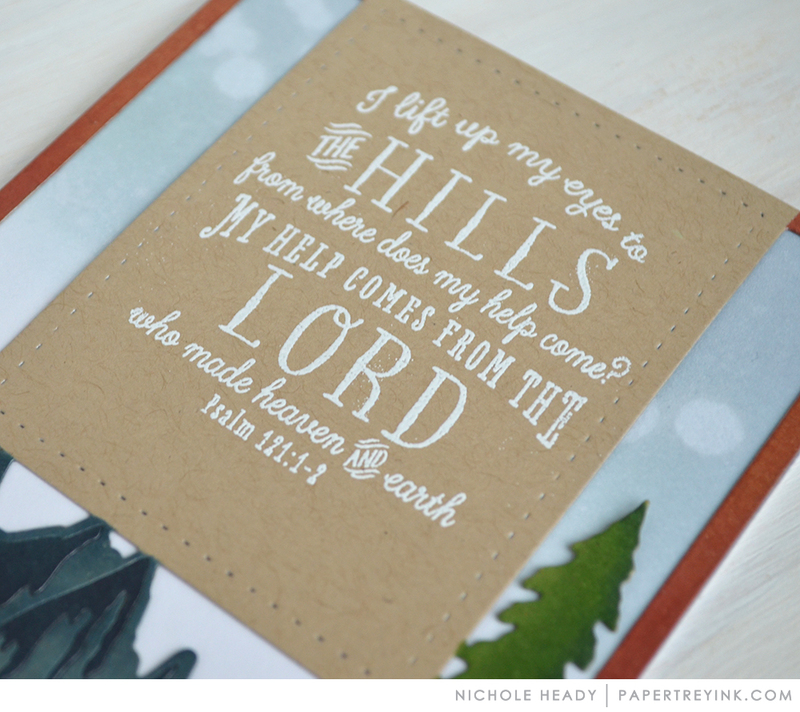 A year of Psalms with Papertrey Ink! This is perfectly wonderful!! Beautiful cards! 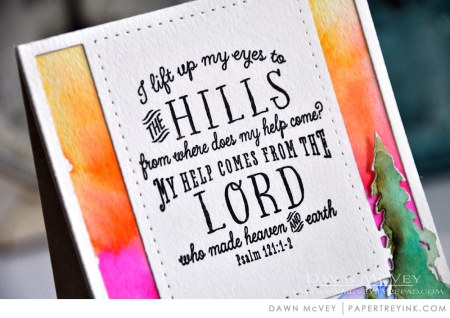 What a combo…mountains and Psalm 121:1-2!! Love it!! Thank you!!! The mountains cover plate is really stunning. My favorite is the one Betsy paired with the Spruce & Sprigs. I live in MN so Spruce and Pine are favorite backdrops for me. The mountain stamps and dies are amazing! Make me yearn to go to Colorado! This had been a fabulous release! Continue to love the Year of Psalms. Mountain Majesty looks great for masculine cards. 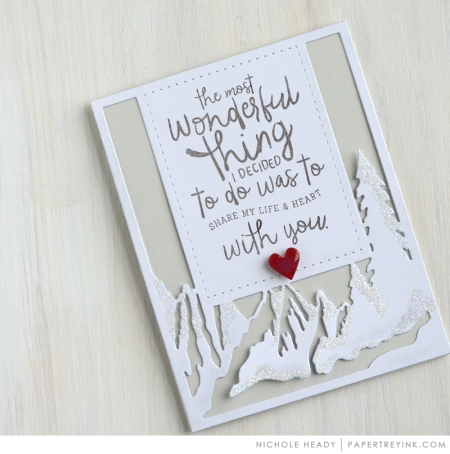 Oh my word – I just LOVE the whole Mountain Majesty stamp and cover plate set. Gorgeous, and the DT is the best with their beautiful examples that make us *need* it ALL!!!!!!!!!!!! Mountain Majesty is amazing! So many possibilities as shown by the design team samples. The mountain background die is absolutely amazing!!!! A must have! You DID save the best for last! Love those mountains. I didn’t think I’d have much use for the mountains and then Betsey went and made a Christmas card that should’ve been on obvious to me! Beautiful! Absolutely loving all the mountain-themed stamps and dies! Must have!! These cards are just amazing to see the way the same stamp & die can be made into cards for all seasons is so creative! This set is on the top of my list! WOW – the projects to day are beautiful. I would have never been drawn to a mountain scene before now! Another great job, team! Oh those Mountains are a dream come true – thank you!! Bravo for the mountains! Such unique dies! Love these releases and the examples using them. Keep the great tips coming! Lovely cards! The mountains are perfect with the Bible verse! The mountain majesty cover plate and coordinating stamp/die set is absolutely gorgeous! Such beautiful projects! Love the new release! Beautiful creations with those majestic mountains. Magnificent! I love the mountain projects! oh my so much eye candy today! Love the mountains! Mountain Majesty is wonderful. What a great set. Can’t wait for release day. Oh these sets look so versatile, love all these cards by the DT!!! What amazing new products that a perfect for masculine cards. Love both mountain majesty and year of psalms. This July release has been amazing. Your designers are so talented! Beautiful cards today! WOW! The mountain stamp set and dies are AMAZING. So unique. I don’t think I’ve seen another stamp set/die like this. Great job PTI! Oh my goodness, delightful new release!! So much fun to see all the wonderful design team projects!! Love this! I have been wanting mountains for my cards! Living close to the mountains, myself, all of the products today are a must have for my stash. They are beautiful. Oh, those mountains look amazing! Betsy’s done it again! I have been looking to expand my stamp options for men’s cards. The Majestic Mountains are gorgeous! Don’t believe I’ve ever seen anything similar. Betsy has done it again! I absolutely love Mountain Majesty! Love! Love! Love! 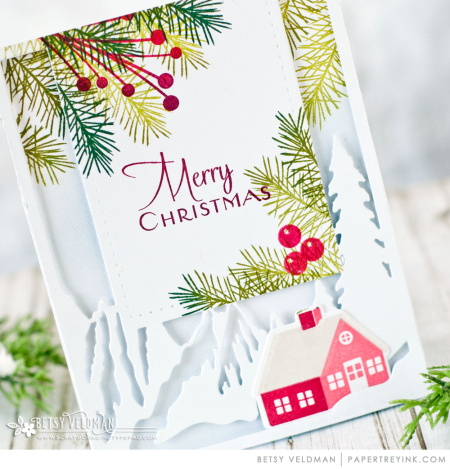 I’m so excited to see some Christmas cards in the mix, using the new product! The mountains and cover plate are gorgeous! Mountains!!! 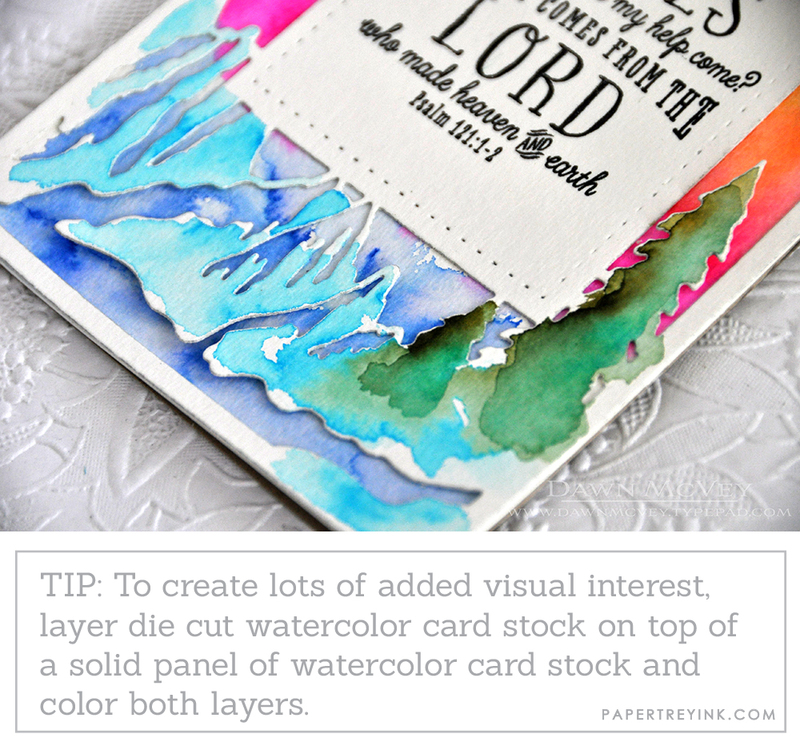 Wonderful layering set and dies too. I’m really loving this. The year of Psalms is so inspiring. Thanks for another fabulous day of truly beautiful cards and tips. Love those magnificent mountains, so beautiful. The mountains are amazing and can be used on so many different types of cards. I love the large sentiments too. I love the mountains … more than any other place. These stamps and dies are just perfect! Thank you Besty, Nichole, and Dawn for inspiring us today. Growing up in CO with the Rockies as the view from my bedroom mountains are dear to my heart. These are gorgeous! This is going to be a super versatile die set! 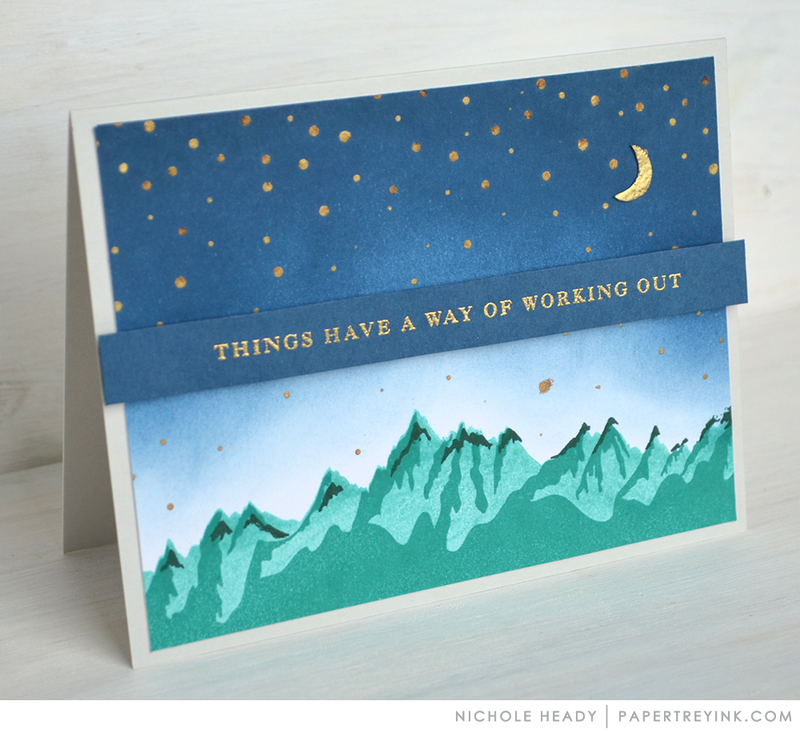 The Mountain Majesty collection is card making made easy! Love how all the elements are provided to quickly complete a card with a generous space designated for the sentiment on the cover plate. Great collection for any season and any occasion as you have demonstrated! 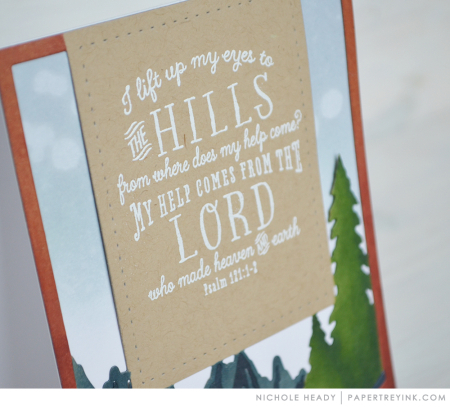 The Year of Psalms verse and cards made with it are so inspiring in more ways than one! I also love the Majestic Mountains—it’s beauty and versatility. The works of art you gals created are amazing, too! I love cover plates and the majestic mountain one is really quite beautiful and very versatile! Beautiful. I moved to Colorado in the last year and the mountains are perfect to represent my new home, near the Rocky Mountains. Really nice Majestic Mountain cover plate. Oh, the mountains!!! My family spends a lot of time in Yosemite. 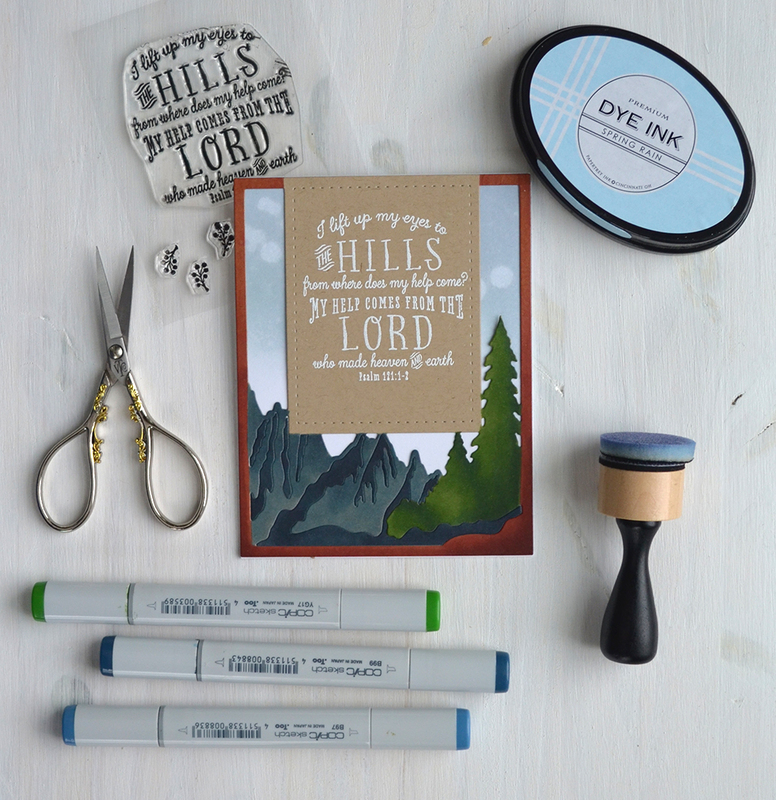 I can’t wait to use the mountain stamp set for my scrapbook pages! The mountains are amazing. So many possibilities. And the Psalm is perfect! Mountain Majesty looks spectacular and truly magical. Living in the great state of WA, that’s a must. Today’s post is my favorite with all the gorgeous inspiration! Absolutely stunning, I love mountain majesty. I love all the varied scenes on these cards! Beautiful new products! The mountain set with the Psalm verse is perfect! Love, love, love all the new stamps and dies! I look forward to seeing the new Year of Psalm stamps every month. The mountain dies are a perfect pair for this month’s set. Today’s projects are all beautiful. This is making me nostalgic. Spent my youth looking at a mountain range from my home in the CA high desert. Love these products! Great mountain dies.Youseem to think of everything! The mountain Majesty is beautiful! I can picture great masculine cards made with this die. I love the Christmas card done by Betsy! Oh wow! These are beautiful! These products & cards are amazing!!!! The Cover Plate Mountain Majesty is awesome. Loved the many ways the ladies used it in their projects showing its versatility. I absolutely LOVE the Mountain Majesty products – and projects! I love all the new mountain items!! Awesome the Mountain Majesty stamps!!! Love all the breathless backgrounds!!! Love, love, love all these stunning cards!!! Oh boy I am in trouble as I love EVERYTHING in this new release!!!! You definitely saved the best for last! Mountain Majesty is such a clever design and the cards made with it are just stunning! Looks like I’ve found my design for this year’s Christmas cards!! The majestic mountains are gorgeous! Love the Mountain Majesty cover plate and coordinating die set. Love the new Psalm verse. The card samples are stunning. All of you are very creative and make works of art. 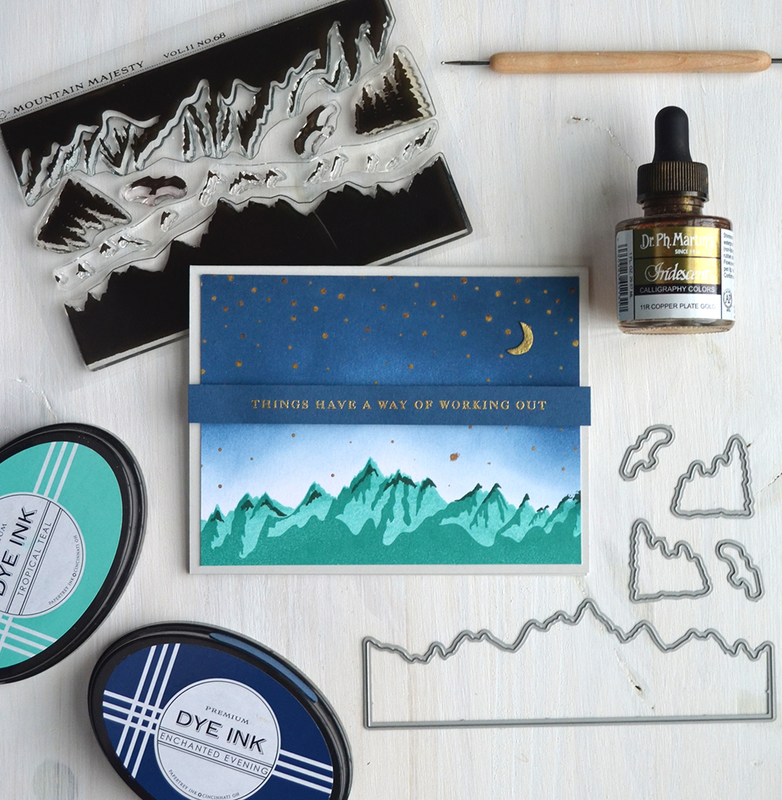 Oh my word, the mountain layering stamp set!!! So, so gorgeous!! Love! What fun new products and lovely inspiration. The verse and mountain stamps and dies are stunning. The beauty of this set of products is gorgeous! The mountains are so lovely and peaceful! The eagles add the perfect finishing touch. Love the pretty verse and everything I’ve seen! Your designers have shown us he most beautiful cards!! Yep! In my cart for sure! I am definitely a mountain girl. Those mountains are so majestic! In my cart they go! I am a mountain girl-always have been always will be. I have to have those stamps and dies. Can’t get them right away because I’m saving for a trip to NYC this fall to see my youngest daughter. Also I do lift my eyes into the hills for the Lord’s help. That one too! Great release! Loving what creative things the team did with Year of Psalms: July! What can I say but “wow!” The stamps and dies today are fantastic and so is the artwork. Thanks for the inspiration! You guys have taken my breath away today! Gorgeous projects! The Mountain Majesty products are gorgeous! Love the sentiment block on the cover plate. Love the mountain stamps and die cuts! Love the cover plates and sentiments! This release is amazing! Love the mountains! Also excited to start Christmas…Winter Village and dies will be perfect! Wow, that is such a unique set, love the mountains!!!! Wow! All these mountain cards and products are absolutely beautiful! 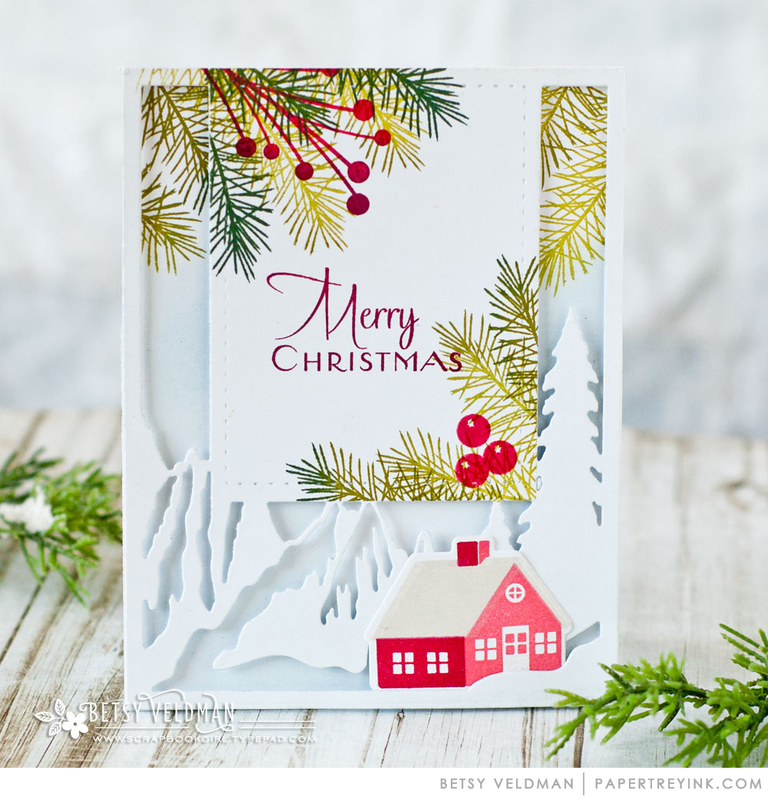 I especially am loving the card made with a winter/Christmas theme and would definitely be using these products to make my Christmas cards! I love this month’s choice for the July: Year of Psalms! The different mountain products are gorgeous, too! 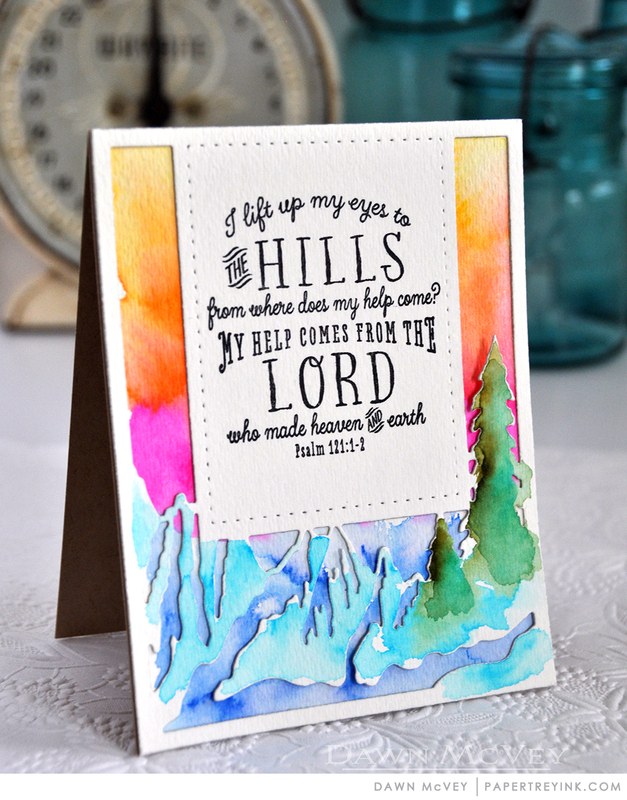 Such a wonderful blend of scripture and mountains! Love it! Love the mountain cover plate. All the creations the design team came up with are just fabulous! Love Mountain Majesty and all the projects today! Wow those mountains are amazing! The Mountain Majesty is gorgeous!!! Beautiful! I love it all, esp the cover plate! Oh how beautiful! 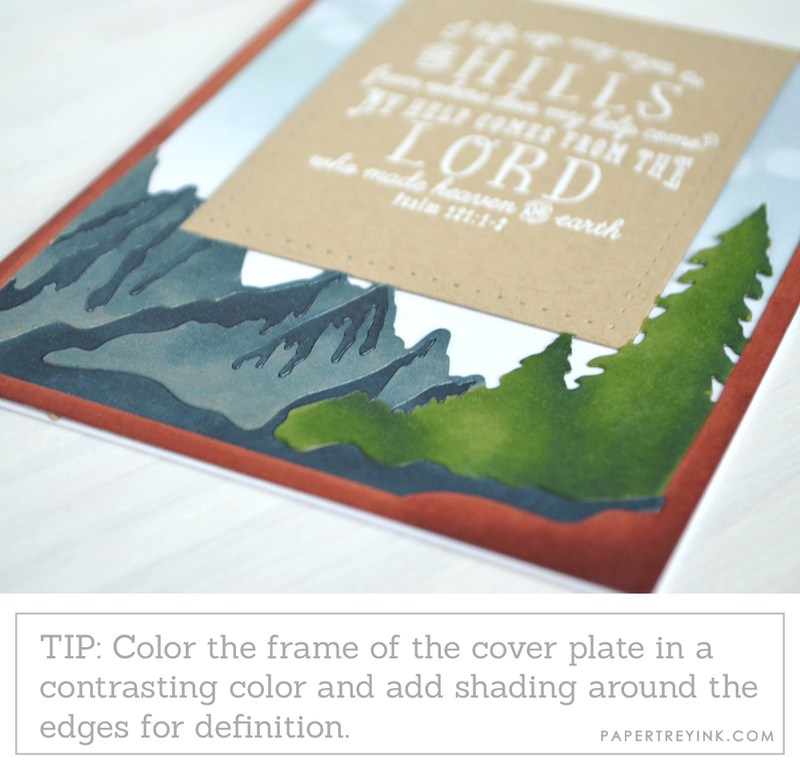 LOVE the Year of Psalms paired with this Mountain Majesty cover plate! All of the DT samples are gorgeous ~ Dawn’s water-colored card is an amazing frame-worthy piece of art! These images remind me of the Pacific Northwest. So pretty. Those mountains are gorgeous and give so much detail!!! Beautiful layering too! The majestic mountains are stunning! Loving the detailed mountains stamps! And now that mountain cover plate is on my list, too! Gorgeous! Oh, the mountains! They are amazing. I’ve been waiting forever for some detailed multi-step mountains. I hope there’s more to come. 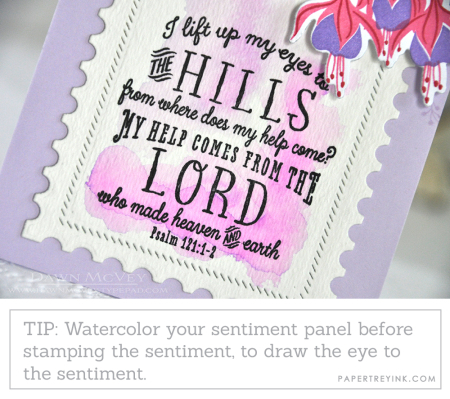 I love the hills die-cuts, and that was my Grandpa’s favorite Bible verse. Great memories for me. A definite must-have set. Love the Psalm for this month. So much creativity shown today. Wow-O-Wow! Just an amazing release. The mountain projects are incredible. I love this time of month! Wow!! That mountain stamp is awesome!! My favorite day yet! I love everything! Wow…every single card is like a little work of art! Thanks for the endless inspiration. Mountain Majesty is just gorgeous! You’ve chosen one of my favorite verses for Year of the Psalms: July! I am so loving Mountain Majesty…and this month’s Psalm selection is one of the best ones yet! I just love the mountain cover plate-absolutely beautiful. Really impressed with the Mountain Majesty stamp and cover plate die. Love the Christmas card that was made with it. It will be a welcome addition to anyone’s stash! The Mountain Majestic die set is fabulous! Lots of different ways to use the die! I enjoyed today’s creations! That Mountain Majesty cover plate!!!! Wow! The multi-step mountain border images in Mountain Majesty are genius! Mountain Majesty…there are no words. I will be getting all 3 items. That darn Betsy!! Wow! What a spectacular release! Mountain majesty has touched my heart–I live in the Rockies!! So Mountain Majesty is a must have. The mountains are fantastic! So useful! So versatile! Wow! I just love the gorgeous mountainscape stamps! Very majestic and aptly named. I love the Mountain Majesty cover plate. It can be used year round! Have added it to my shopping list which keeps growing. I live in the beautiful state of Colorado with magnificant and majestic mountains. These stamps and dies will be a fab addition to my cards! Can’t wait for tomorrow, love this whole “set”. I am loving the new mountain stamps and dies!!! Fabulous! I am so excited about the Majestic Majesty die that will pair so perfectly with the Year of Psalms!! The mountains are just lovely. I really like that almost-all white version by Nichole! Mountain Majesty is inspiring! Each release time is so fun…thank you for the inspiration! Mountain Majesty is simply stunning! There are so many ways to use this set, and the cover plate is awesome! So excited. Love the mountains. My list gets longer everyday. Wow! Love the mountain themed products and the Psalms are a beautiful compliment!!! Lovely landscapes! And Betsy’s Christmas is gorgeous! Wow the mountain die is amazing. Love the beautiful a year of phalms stamp this month. Gorgeous projects. Stunning sums today up! I love all the detailed mountain products, they will just instantly make any project special! 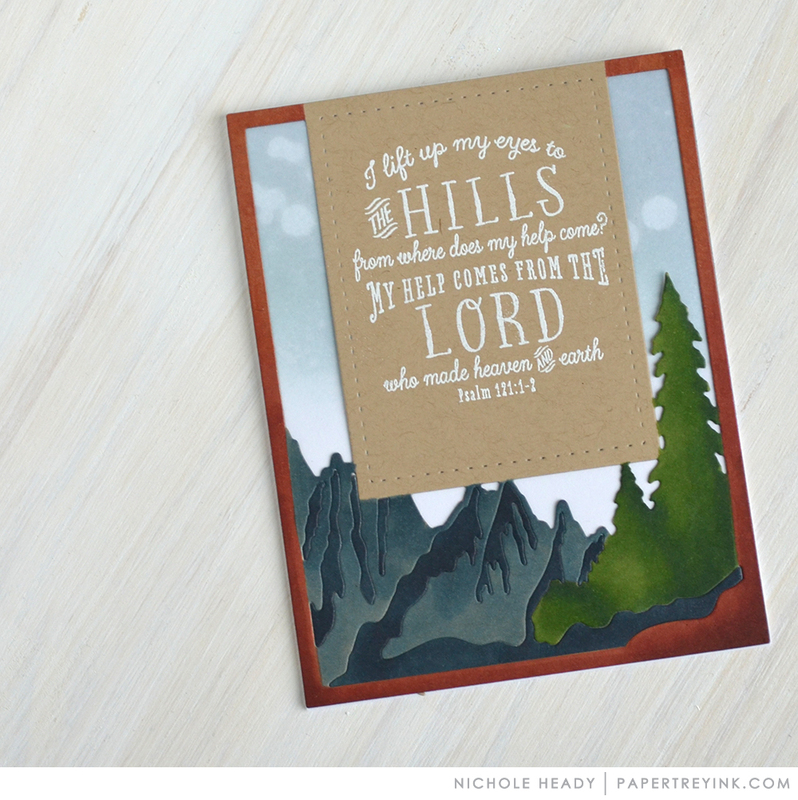 Love all the mountains and the Psalms stamp! The mountains set is so awesome. So many ways to use it. Absolutely love those Mountains. No one else has stamps anything like these. They are must haves. What a wonderful post, using your majestic mountains die. Such a variety of ideas were shown. Impressive! I love the way the words look in this month’s Year of Psalms stamp!! Love the Mountain Majesty stamp and die sets along with the Mountain Majesty cover plate. As I am an outdoor lover, these stamps and dies are perfect. Thanks to all for sharing their beautiful creations. OH GOODNESS! 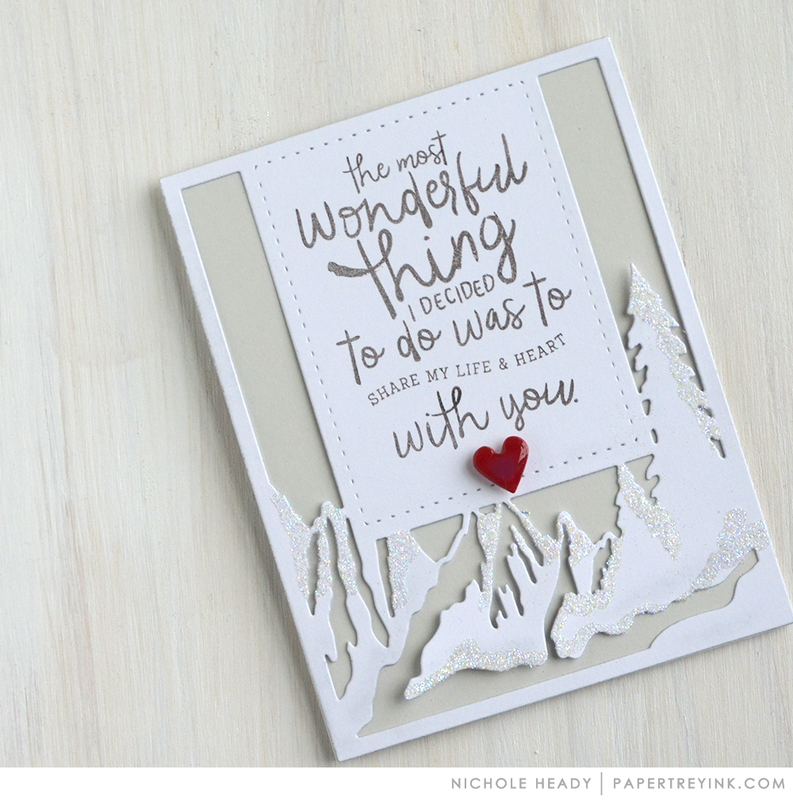 I’m so excited about the Mountains Majesty set, just gorgeous with all the DT projects! The Majestic Mountains live up to their name – they are majestic and add some awe inspiring backdrops on projects. Oh my! The Year of Psalms is beautiful each month! Especially I like the orange and purple card using this month’s verse! Love, love, love the mountains! Both the cover plate, the stamp set and the dies! The Year of Psalms is such a wonderful scripture as well! Winning products that I plan to order. Thank you! Loving the majestic mountains and year of psalms!! 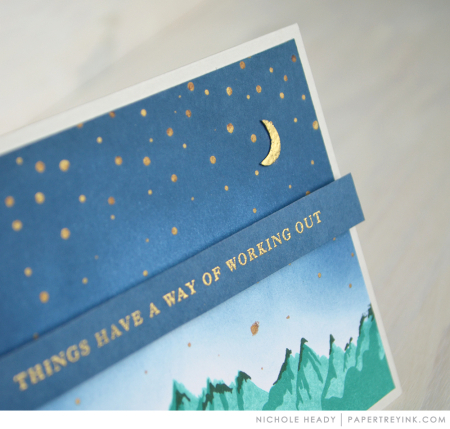 Absolutely beautiful inspiration cards. Wow. All the mountains are beautiful! My favorites are the mountain stamp set and the cover plate. I love the gold accents by using the gold calligraphy ink! Psalms is my favorite book of the bible. I am so happy you are doing these monthlies. Love the Mountain Majesty set and the Cover plate, so many uses! All of the inspiration projects are beautiful! Love the Christmas card you created. I wouldn’t have thought of using Mountain Majesty that way. Thanks for the inspiration! The colors in today’s cards is just stunning! So beautiful! 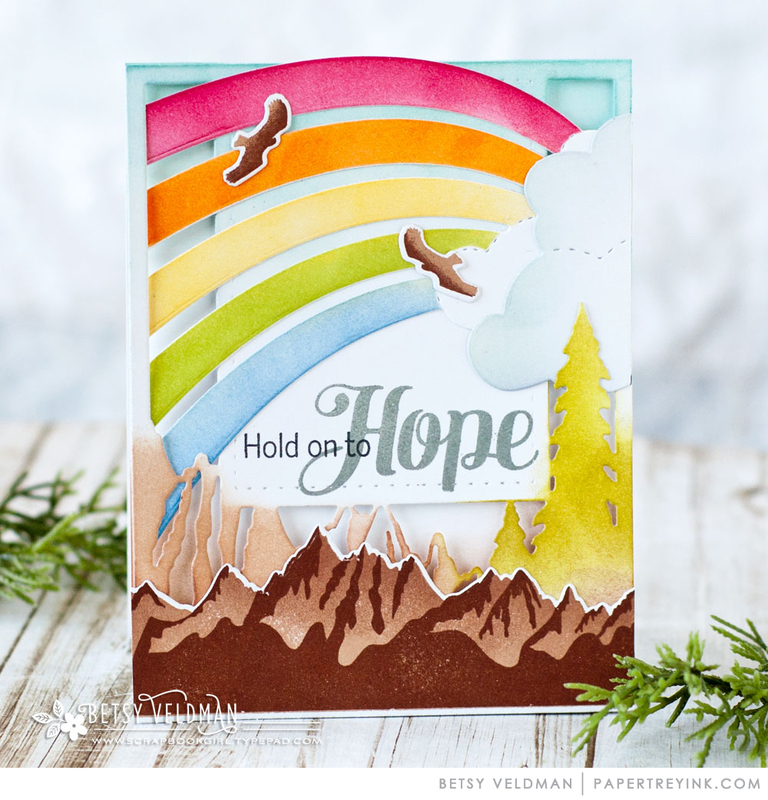 Beautiful mountain stamps and dies! Just gorgeous! Thank you for the chance to win some great PTI goodies. Mountain Majesty is wonderful and looks so versatile. I love all the different ways it was used. Wow, I love the mountain stamps and cover plate and the projects created by the design team are outstanding! I love the mountains! I can’t wait to see this stamp tomorrow! I’m thrilled with the Year of Psalms stamps and the fonts used. I use them for Bible journaling and card making. There are many items on my wish list from this new release and tomorrow will be exciting! Thanks to everyone for their hard work. The Mountain Majesty items are amazing. The sample cards are gorgeous. Can’t wait to order them! Looking forward to the Year of Psalms: July stamp set. Love what the design team did wit this set. This is shaping up to be a great release (aren’t they all?)! SO many wonderful things to choose from this month! I love the mountains. So many different uses for them. Quoted: The Most stamp is perfection! I am loving all the friendship quotes you have been releasing! Absolutely stunning projects by the entire DT! The mountain die is a great idea. Very unique! Seeing as how I live in the shadow of Pikes Peak, I think I kinda hafta have the mountain majesty stamps and dies! the mountain set is stunning! Thank you for the beautiful inspiration. Love the mountains! Stamp set and die! Psalms 121:1-2 is one of my favorite Bible passages. must have this stamp. I love the mountains. The projects today are stunning. Colorado is one of my favorite places to be in the gorgeous mountains there. Todays post is filled with such gorgeous creations. Amazing. I also love the colour, everywhere! Stunning. Mountain Majesty is calling to me. Beautiful designs and am inspired to be using them already. Those mountains are amazing. I love the variations of colors used on them. Great cards. The Mountain Majesty stamp set and Cover plate are so beautiful. The Mountain Majesty is spectacular. I love the possibilities for seasonal use. Thank you PTI and DT. I could see so a whole bunch of quick and easy Christmas cards with Mountain Majesty – I love it! Truly amazing products and projects. Love!! Loved seeing all of the DT’s beautiful projects…thanks for sharing. Beautiful creations with the Mountain Majestic cover plate! Love all the different looks! These are fabulous projects today!!! Oh my. Hard to choose my favorites this month. Wow! The mountains are so gorgeous in every single project. The majestic mountain set and die are beautiful and the project’s done with these are gorgeous. The mountains are unique and lovely! Everything is so beautiful! I love the new Psalm for July. I’m collecting all of them. They are so inspiring! Wow. The majestic mountains is a great. The mountain majesty sets are just amazing, I can hardly wait to add to my collection! Wow! These sets are amazing! Such gorgeous creations – love the scenery! So creative and beautiful! I really like the Mountain cover plate die that has a nice sized blank space for a substantial sentiment. the mountain majesty coverplate is absolutely brilliant!! Wow, the Mountain Majesty is gorgeous!! Awesome cards everyone, thanks for the chance to win! Wow! I looooove the new Year of Psalms images and the Majestic Mountains set! And all the cards are stunning and inspiring! Wow – the new Cover Plate is incredible & the Mountains Majesty stamp set is truly majestic. Today’s projects from the team are jaw-dropping! Very peaceful and serene cards! Love the New Year of Psalms. A fantastic release. 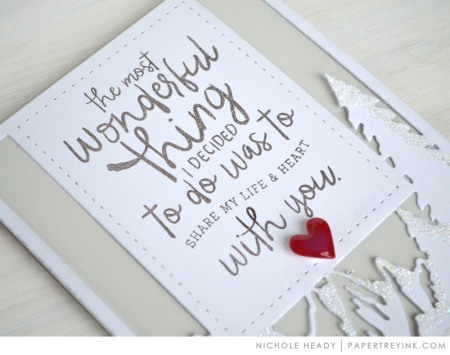 I love the Quoted:The Most sentiment, great for wedding and anniversary cards. Mountain Majesty is perfect for building scenes. Fabulous. Beautiful samples! I really like the mountain cover plate. Wow, what an awesome die set. So versatile! Mountains coverplate is a fav. Also enjoy seeing the postage stamp layering set. Another great release day! I’m excited looking at everything that was created! Love that Psalm! 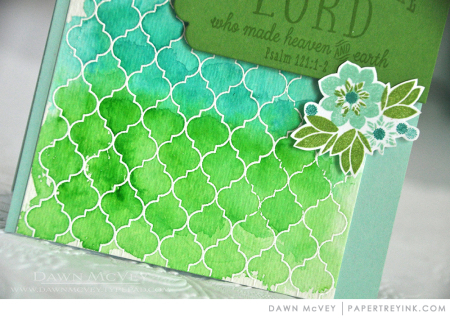 Dawn’s card with the quatrefoil stamp and the Psalm is beautiful. Mountain majesty is just stunning! I loved all the beautiful projects today! Beautiful cards using the Mountain of Majesty! Love the watercolor and blended colors. Thanks! Love the Majestic Mountains. Beautiful cards today.